This is a sort of a “Feel the fear and do it anyway” book. Asimov discusses fear of wine (wine anxiety, he calls it) in the USA but I struggle to imagine the anxiety is much different in the UK for those not wanting to embarrass themselves by choosing the ‘wrong’ wine to go with their dinner, or not spotting a faulty wine in a restaurant. I agree that wine does indeed often come with the perception that we “ought to know something about it”? But is it really only wine that comes with that perception? I’m not sure I agree there. What about art (fine art? ), books (classical literature? ), music (classical music?)? Would we enjoy these a little more if we had a little understanding of genre, structure, context, harmony, balance? Or perhaps it’s just me that believes my own understanding and appreciation (and love?) of such things as art, books and music would be on a higher plane if I understood a little more about them. I absolutely agree that wine is all about the joy and voyage of discovery. Does there need to be right and wrong? It is about pleasure and simply whether you like what’s in your glass. And of course, I agree that a sense of curiosity is pretty much all you need to get more from your wine tasting experiences. It doesn’t need to be more complicated. This is an enjoyable monologue of Asimov’s own journey through the wine world, to his responsibly lofty position of chief (and only, he clarifies) wine critic of the New York Times. His series of reflective essays are entertaining for me as someone already entrenched in the wine industry for many years, who has a grasp of what’s between the lines, but I wonder how meaningful they might be for who I assume is his target audience – those folk who are already wine anxious and who he looks to reassure. Having said that it is an eminently easy to read wine-autobiography of a prominent journalist with many interesting stories to tell, which he angles adroitly to his task of encouraging the wine anxious to feel their fear and dive in to their own discovery. Among many things, for example, the frailty of wine critics and wine scores are addressed (would we score a piece of fine art out of 100, in the hope it might offer concision and clarity?) and greatness in wine (too) briefly touched upon. 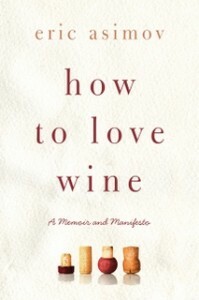 The manifesto part seems to be asking us to love wine as a route to understanding it rather than learn wine as a route to loving it. I’d certainly go along with that. If you fancy getting some insight into the ambiguous, contradictory, delightful and tasty world of wine, this should be a good read.